Sections D and G of the Kolegio San Luis Beltran school will now also get a facelift. 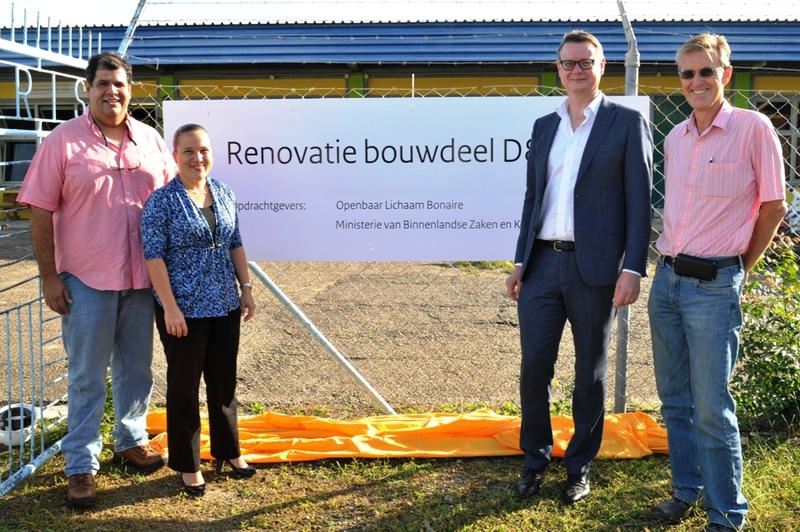 Kralendijk – Mr. Bonnet of the Ministry of the Interior and Kingdom Relations, together with Education Commissioner Nina den Heyer have recently given the go-ahead for the refurbishment of sections D and G at the elementary San Luis Bertran. The elementary San Luis Bertran was already being refurbished by the public entity Bonaire and the Ministry of Education, Culture and Science. Five of the seven components under reconstruction will soon be back into use by the elementary school. The two other components (D & G) will now also be renovated. According to a press release by the Public Entity, this offers the possibility to create a “community school” concept in the future. There will also be education-related functions are housed in this building, such as a nursery. The renovation of sections D & G will consist of replacing the roof, adjusting the windows, minor adjustments to the toilet area and the painting of the sections.